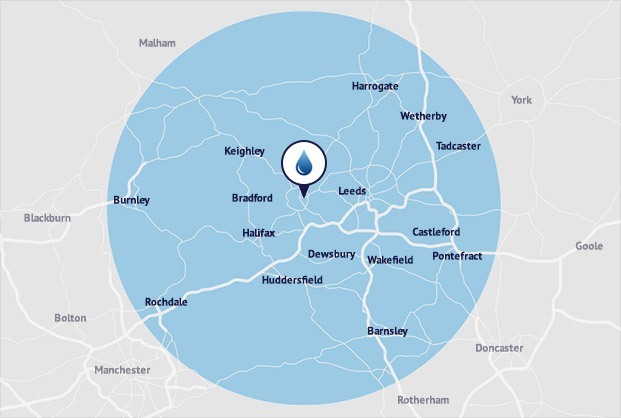 At BASI, we’ve been serving the homeowners of Yorkshire for over 25 years and as our capacity has grown, we’ve taken our bathroom installation service far and wide. We now install bathrooms in Yorkshire, Lancashire and Greater Manchester. We’re proud to offer local plumbing services to Leeds and beyond, delivered with the ease and professionalism of a large, national company. Our tried and tested process combines market-leading products, competitive prices, detailed planning and dedicated service throughout. Our team of qualified plumbers travel the length and breadth of the Yorkshire region, taking our bathroom planning and installation service to customers in the comfort of their own homes. It may involve plenty of travelling for our team, but we find working in this way makes the process hassle-free and enjoyable for our customers. Can BASI bathrooms help you? Although our bathroom installation service is based in Yorkshire, this doesn’t mean we are restricted when it comes to helping new customers residing outside our usual service area. We’re lucky enough to have lots of happy customers recommend our bathroom and plumbing services within Leeds and Yorkshire, but it’s nice to be able to expand our remit in order to help new customers outside of this region too. If you’re wondering whether BASI Bathrooms might be available to take on your bathroom installation project, take a look at some of the most commonly visited places below for a rough idea of our coverage. The map above covers some of the places we’ve previously completed installations, but it’s only a snapshot of the areas we’ve worked within over the years. If your town or city isn’t featured on the map, don’t worry – this doesn’t mean we can’t provide you with the services you need. If you would like to know for certain how BASI Bathrooms can help you, please don’t hesitate to contact our friendly team on 0800 980 6018 who can provide you with all the information you need. Alternatively, use our contact page to request a call back at a more convenient time for you.